Father’s Day is right around the corner and it’s time to start thinking about how we will spoil our special dad on his big day. In our house, it starts with food. For every big event in the family the guest of honor gets to pick his or her favorite meal. For our dad, it will probably be grilled filet mignon with herb butter. 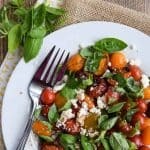 He loves tomatoes so I thought this Grilled Tomato Salad With Feta and Basil would be a nice side dish to go with his steak. He will be so happy with breakfast in bed and steak for dinner. I’m a bit obsessed with grilling lately but I want to take advantage of every second of summer cooking. I am trying to be open to grilling new seasonal foods like these sweet cherry and grape tomatoes. This was an heirloom mix with yellow, red, and black cherry tomatoes. I can’t describe how good they are when grilled. It changes the flavor and makes them way sweeter with a bit of smokiness. They become softer but not in a mushy way and when you add the salty feta and the spicy, sweet basil you have a hit. If I were making this for a cookout I would serve it immediately after grilling while the tomatoes are still warm. I ate mine the next day as leftovers and it was just as good. It can be used to top a pizza, leftover chicken, pasta or a piece of naan bread for a quick lunch. Mmm, or how about using grilled tomatoes to make bruschetta? Or pile it on a big round of warm brie and spread it on crackers. Again with the grill toppers? I love these things. Yes, you can also grill tomatoes in a foil packet but I like for a bit of the flame to reach them and give them some color on the outside. Skewering the tomatoes is also an option but who wants to go to all that extra trouble? Buy some today and try grilling tomatoes. You’ll be glad you did. 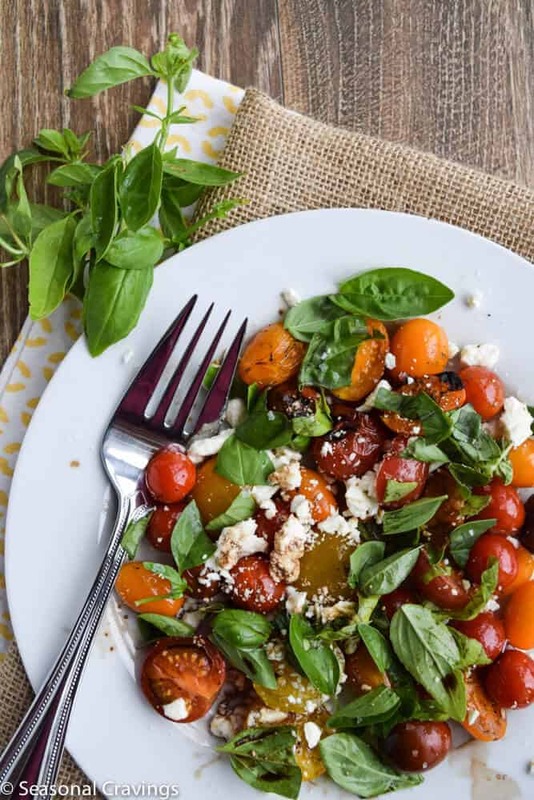 Juicy, sweet grilled tomatoes topped with feta and basil. Toss tomatoes with a drizzle of olive oil. Grill tomatoes on a grill topper on medium heat for 5-8 minutes. Watch carefully so they don't burn. 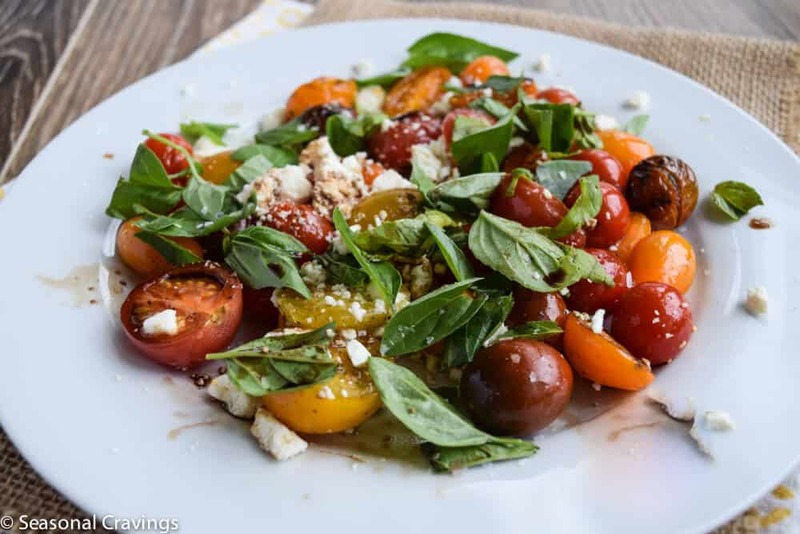 Remove from grill and immediately toss with feta and basil. Drizzle oil and balsamic vinegar over top. Salt and pepper to taste.